Peter Burling and Blair Tuke won six of the 11 races. Photo: Yachting New Zealand. 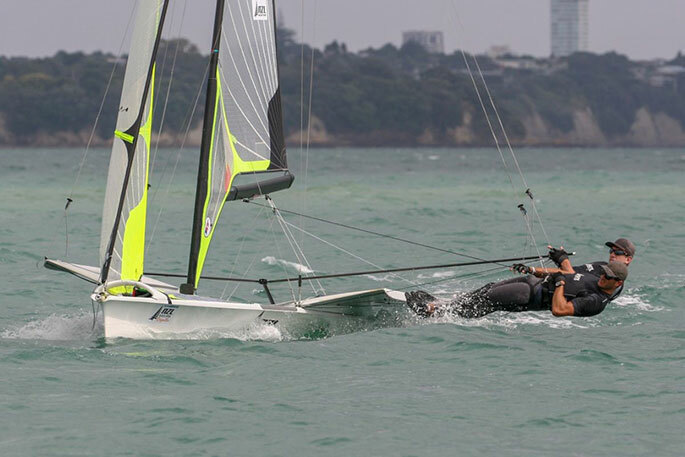 Peter Burling and Blair Tuke made a habit of winning in the last Olympic cycle and started their new campaign in style by taking out the Oceanbridge NZL Sailing Regatta. They won six of the 11 races off the Royal Akarana Yacht Club on Sunday to finish 14 points ahead of Isaac McHardie and William McKenzie, with Josh Porebski and Trent Rippey a further eight points behind in third. “It’s been great,” says Burling. “It’s been a little like riding a bike; a lot of things come back really quickly. At the end of the day you need to put in a lot of time and that’s we’ve been doing over the last four or five months. “[Winning the trials] means so much because it’s what we have been training for for the last 18 months,” says Liefting. “It’s been really nice to put together a good performance this week and sail some better races,” says Burling. “It definitely felt like we were sailing a lot better by the end of the weekend.